The success of public campaigns such as the Jubilee Debt campaign depends on individuals being prepared to 'stand up and be counted' as a supporter. 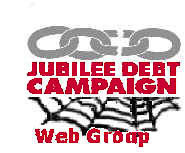 The Jubilee Debt Web Group, provides a 'no hassle' channel for supporting the campaign, based on communication over the web. As a supporter you can control your involvement from simply registering support through to becoming involved in lobbying through letters and emails or joining the mass, peaceful, demonstrations and publicity events.